This centre provides modern office suites on flexible terms. Some parts have been freshly refurbished, and the centre is well equipped to meet your needs. The centre is located in a park setting, and is approximately 3 miles from the centre of Aberdeen. This building has recently been refurbished to a very high standard including the shared communal areas such as the toilets and shower rooms to now include lockers and hair drying facilities that are a must for those wishing to cycle to work. The business park has easy access to Aberdeen city centre and the airport with its excellent national and international scheduled air services, plus good road and rail links north and south of the city, available via the New Third Don Crossing (Diamond Bridge). This space has undergone a recent refurbishment, completed to a very high standard, and including the communal areas. There are lockers, showers and bike racks for those cycling to work. The workspace has easy access to Aberdeen city centre, where there are various amenities, as well as the city's airport. Tjhe railway station offers good road and rail links north and south of the city, and countrywide. Located in a prestigious business park on the south side of Aberdeen are fantastic co-working spaces available on flexible terms. The property boasts professional on-site meeting rooms and ample on-site parking. The space comes fully serviced with a high speed dedicated internet connection. The offices are of a great design with open-plan and lots of natural lighting. A cafe and Sainsbury's are just a stone's throw away, providing nearby options for lunch breaks. Fully serviced, high quality office space in an attractive, recently refurbished period building. Situated in a prime location in Aberdeen city centre, the building offers full reception and support services, meeting/ conference room facilities, and air-con and kitchen areas. Within walking distance of both the train and bus stations, with quick and easy access to the airport. The city centre location offers a complete range of local amenities. This newly renovated building is located in central Aberdeen, with great transport links in the surrounding areas. Just a five minute walk will bring you to Union Street, the main street in Aberdeen, with the main Railway and Bus Stations accessed in under five minutes' drive from the building. The office space has plenty of private suites that can accommodate up to eight people, with an onsite cafe and kitchen facilities to keep you fuelled throughout the day. There is also an outdoor patio area, giving you great opportunities to network with the rest of the tenants in the building. You can take advantage of the conference rooms available to you, all fully equipped with the latest technology. and onsite reception services, alongside ongoing IT and admin assistance will ensure you are given full support throughout your working hours. Just moments from Union Street, this centre is based right in the heart of the city of Aberdeen and is part of a major regeneration project. Tenants will have private offices, coworking and virtual office options, with the centre also having meeting rooms, floor-to-ceiling windows and lots of natural light. There are also showers, parking, an onsite coffee bar and bike racks. Aberdeen station is 10 minutes walk. This office space is modern and spacious, offering the perfect solution for your business. There are private offices and co-working spaces available, with a stunning view over the central atrium. The office space has an abundance of natural light that flows into the working area, due to the floor-to-ceiling windows. The building has on-site car parking, bike storage and shower facilities. Tenants can also benefit from a fantastic on-site coffee bar. Situated in Aberdeen, just a 20-minute walk from the city centre, this modern and stylish centre offers serviced and virtual offices, along with meeting rooms. These fully furnished offices benefit from 24-hour access, WiFi, bike racks, and full-height glass windows that offer great views of the surrounding area. Nearby, there are several bus services, and Aberdeen Railway Station which is just a five minute drive away. This centre is located in the heart of Aberdeen, on Chapel Street, and offer an ideal address for you business. These serviced offices are suitable for from 1 to 250 persons, and are available for immediate occupation. Newly refurbished office space in the heart of Aberdeen. Offering cellular and open plan office space which can be adapted to meet your needs. A full range of amenities is available, and the property is close to public transport links including the Railway Station and bus stops. Aberdeen Airport offers international travel, and there are many shopping options in the city, as well as hotels to suit different budgets. A listed building offers fully serviced office space. Within walking distance of both the bus and train stations. Recently refurbished office space that offers excellent facilities for tenants. There is 24-hour access, high-speed internet and a great on-site café. There are fantastic reception services, break out areas and a communal kitchen. This centre is less than two-miles from the city centre. There is lots of car parking available on-site. Alternatively, it is easily accessible by bus. Aberdeen’s airport is within a 15-minute drive. The centre is based on the outskirts of the quaint village of Aboyne, Aberdeenshire. Offering good quality office space, the centre is ideal for small to medium sized businesses and gives tenants independence with self-contained entrances. The centre offers easy in, easy out terms and rates include rent, cleaning of common areas and onsite car parking. Aboyne has several nice eateries, and the centre is only 50-minutes drive to Aberdeen. Ideal for anyone working in global oil and gas technology, this soon to open centre is ideally situated on a major 54-acre business park, right on the doorstep of Aberdeen International Airport. Hotels nearby include the Aberdeen Marriott, just a couple of miles away, and transport links include Dyce Railway Station as well as a direct road to Inverness, the A96. The space is accessible 24-hours a day. A long-established business centre offering a range of stylish offices in Aberdeen's West End. In a converted period building, with a complete reception service, equipped with high-speed internet and digital phone systems, as well as beautiful modern furnishings. There are on-site parking spaces provided. The space is located within walking distance of the city centre, and offers easy access to the A90. 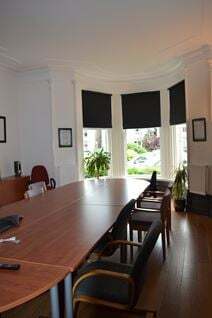 Based in the West End of Aberdeen, this stunning Victorian building is home to fully furnished private offices, a business lounge, kitchen facilities, dedicated meeting rooms and a reception. There are shared gardens to the front of the property and parking to the rear. Tenants can also make use of the on-site shower facilities, high-speed internet and state of the art telecommunications. The centre benefits from great transport and road links with the A90 and Aberdeen railway station not far away. With classic Victorian features throughout, this independent boutique business centre provides private and co-working office space ideal start-ups looking for a prestigious home in Aberdeen"s West End. Office space is rarely as grand as this beautifully restored Jacobean style villa minutes from the city centre. With an attractive modern extension it has managed to retain many of its magnificent period features. In the city centre, Aberdeen Railway Station runs intercity services to a number of destinations including London, and there are great places to eat, drink and shop. Aberdeen Airport provides international travel. Professional quality office accommodation in the heart of Aberdeen. Flexible short term leases available. The location offers a range of retail and restaurant options, as well as excellent transport links, with the train station within walking distance and the airport easily accessible. There are meeting rooms available, as well as a business lounge, kitchen facilities, internet access and virtual office options. On offer at this location is a range of high quality office space within a two-storey building in Aberdeen's West End. Fully furnished and equipped with broadband and digital phone systems, along with full reception services and on-site parking. Located close to the A90, with a wide range of local amenities nearby, including great places to eat and drink, shops, banks and places for any visitors to stay. Fully serviced office space in a prestigious location on Aberdeen's Union Street. A range of office sizes available. Virtual office systems also available. Excellent transport links, with bus routes and the train station all in close proximity, while the airport is within easy reach. All Aberdeen's major shops and amenities are close by. With a range of office sizes available to suit all businesses, from two-person offices to 100+, this contemporary building houses this modern business centre on the first and second floors in the heart of Aberdeen. Professional furnishings and state-of-the-art IT and telecoms throughout as well as well-equipped meeting rooms. The space is accessible by tenants 24-hours a day. Transport links in the area are excellent. Nestled in the heart of Aberdeen, this centre covers the basics with a wide range of amenities whilst also giving tenants the opportunity to build a customised working environment that aligns with their identity as a company. The centre boasts professional meeting rooms and breakout space, along with state of the art technology. The centre is also ideally located to take advantage of all the city has to offer, with excellent transport links and close proximity to a range of eateries.